How can I miss Sarnath Stupa, when I am in Varanasi. 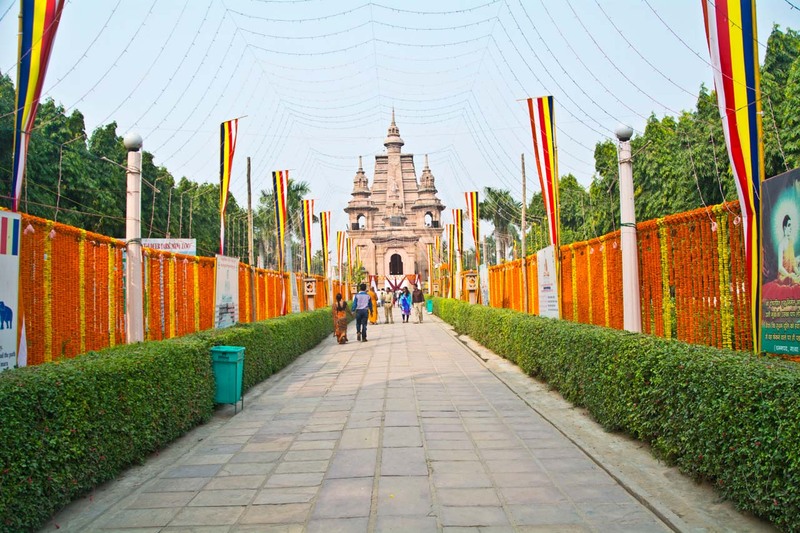 Sarnath is approx 12 km from Varanasi city and a day trip is best option to explore. One morning after breakfast, I decided to go to Sarnath stupa and hired an auto rickshaw (tuk-tuk) for going and return. It is the most popular & economical mode of transport. Autorickshaw charge around 500 for to & fro journey from Varanasi and wait for approx 3-4 hrs in Sarnath. I started around 10.30 AM and the roads were very much crowded at that time. One road was in very bad conditions in Varanasi and added to the traffic chaos, at some places it was too dusty. But once I reached near Sarnath, the condition of road improved a little bit. All the places of interest in Sarnath are in close vicinity and at walkable distance. So, my autorickshaw guy parked his auto in the parking lot and I went for my walking tour of Sarnath on my own. Sarnath is one of the four most important places in Buddhism. Gautam Buddha gave his first sermon here in deer park after his enlightenment. I started from the temple and tree, where Buddha gave his first teaching. There is a statue of Buddha and his 5 disciples under the tree depicting his first sermon’s site. There is a big temple next to the site of the sermon. It is beautiful from the outside and inner walls of the main sanctum are decorated with the paintings depicting the life & teachings of Buddha. There is a golden statue of Buddha in the hall. 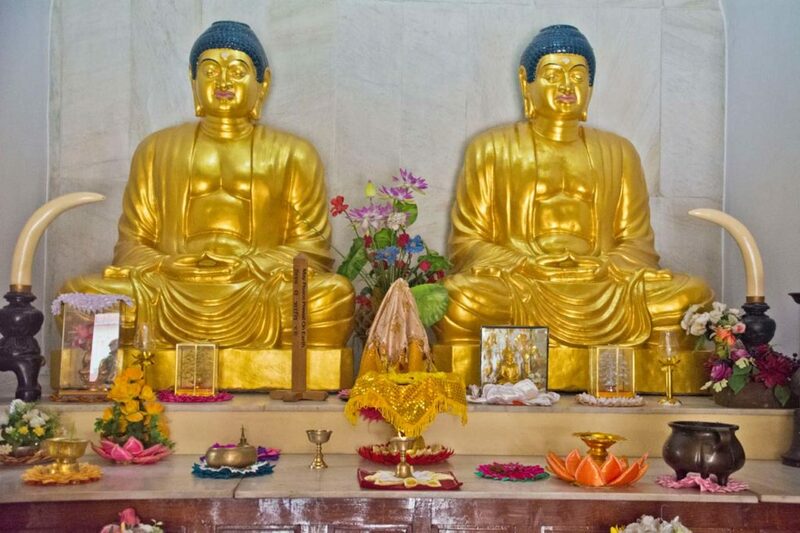 There is one more temple in this complex and twin statue of Buddha in golden color adorn this temple. I came out on road from this complex because the door connecting Sarnath Stupa complex is closed. The Sarnath stupa is under Archaeological Survey of India and they maintain the whole complex. I bought a ticket from ASI’s counter to enter the stupa. It is historically most important monument in Sarnath. The stupa was built in 500 CE to replace an earlier structure commissioned by King Ashoka in 249 BCE. There were several monuments built around stupa to commemorate the Buddha’s activities, the ruins of these can be seen around the garden area. The remains of Ashok chakra pillar were protected with in a glass box in ruins area. The top part with Ashok chakkar is kept in the museum across the road. Ashok Chakkar is a most important symbol for us because it is national emblem of India. Across the ruins, there is a white color Buddha statue situated on a big platform in the garden area. This area was beautifully decorated with marigold flowers and rose petals for celebration and festival week. The Karthik Purnima (Full moon night in November) is one of the most auspicious time of the year in Buddhism. During celebration time Buddhist people from around the world visit here to pay respect. I came out on the road and walked few meters to another interesting place known as Japanese temple. It has two entry gates. There are well-maintained gardens and a couple of temples in this area. The tall statue of standing Buddha in the park can be seen from a distance and it tallest in the area. The whole compound is well maintained and decorated for festivities. The museum had a good collection of important and valuable artifacts. Camera and mobile phones are not allowed inside the museum due to security reasons. There are lockers at the gate to deposit bags. Museum house many important and old artifacts but the most important is Ashok chakra, it is kept near the main entrance. Museum has five galleries & two verandahs to display the antiquities ranging in time from third century B.C. to 12th century A.D. Finally, I went to Chaukhandi stupa. It is the first place I saw from the road while entering Sarnath. It was built between 4th and 6th century to mark the place where Buddha first met his disciples. The place holds immense historical and religious importance due to this. This was the last monument, I visited in Sarnath. There are lots of souvenir shops on road but one needs to bargain to get a good price. There is nothing special about the food. It is easy to get less spicy and vegetarian food. Vaishali restaurant, Green hut, and Rangoli restaurants are some popular places. Nearest railway station and airport is in Varanasi. It is 13 km from Varanasi and all monuments can be easily seen in a day. Autorickshaw (Tuk-Tuk) is a most economical way to visit it from Varanasi. Taxis are also available. 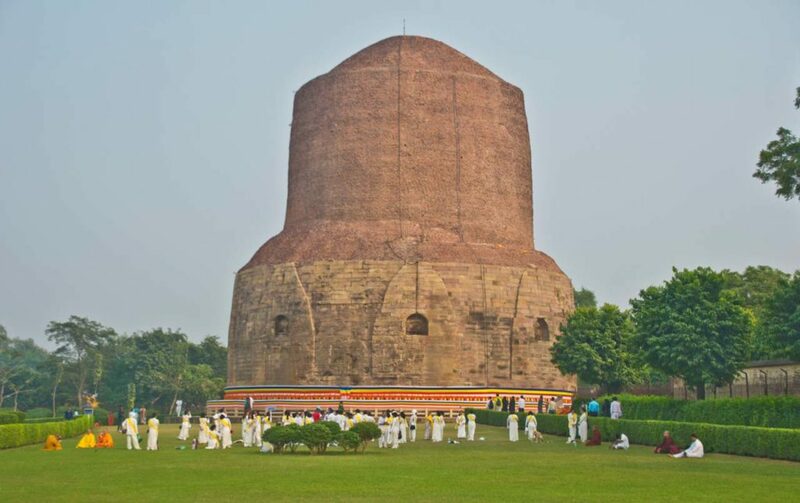 Monuments in Sarnath at walking distance, wear comfortable shoes. Wear cloths to expresses respect for the sacred nature of the city. Circumambulate all sacred places and stupa in a clock-wise direction. Its really a beautiful place to visit . I was there in April 2016 , but now it is well decorated and looking more beautiful !! Yes, they decorate this way around Kartik Purnima.